Iris Folding is a fun way to make beautiful greeting cards. Iris folding is a fun way to make beautiful greeting cards. It has nothing to do with origami and it does not involve folding of any kind. However, we include it in this web site because people who like tea bag folding (which does include paper folding) also like iris folding. The two crafts go hand in hand. The word “Iris” refers to the iris of an eye or a camera. The hole which allows light to enter is called a pupil or an aperture. 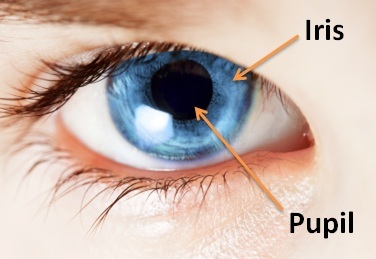 The area that surrounds the pupil and aperture is called the iris. In the case of an eye, the iris is made of muscles which can constrict or dilate. In a camera, the iris is a series of movable blades. The blades come together to decrease the aperture or pull apart to increase the aperture. In iris folding, strips of paper are layered upon each other to give a pattern similar to the iris of a camera. It’s easy to do and the results look magnificent! The first thing you need to do is to choose a template. In this example, a triangle is used. Prepare a Cut-Out Border by cutting a shape out of a piece of paper. In this example, a heart shape is cut out of a piece of white paper. CircleOfCrafters.com has a nice selection of free Cut-Out borders. Use removable tape and tape the template on top of your work table. Next, tape the Cut-Out Border on top of the template. Cut strips of paper of varying lengths and widths. Make sure that the strips will cover the segments in the template you chose. The strips can be of the same color or of multiple colors (3 colors for triangle, 4 colors for square, or 5 colors for pentagon). Glue the strips of paper onto the Cut-Out border. Start from the outer edge of the template and work inwards. Avoid gluing the strips onto the template: keep the glue on the Cut-Out border. Continue to glue strips of paper onto the Border along the lines defined by the template. When done, carefully remove the Cut-Out Border away from the template. Turn over and surprise yourself with your iris fold!